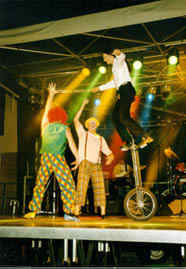 Stagefright Entertainments supplies entertainers and entertainment solutions for businesses & organisations of all sizes. We can offer total solutions to all your promotional and celebratory events. Our research suggests that the British workforce is totally barking mad when it's time to have fun. So you can rest assured that all Stagefright Entertainments artistes have undergone rigorous tests ensuring the provision of five star fun for your completely bonkers staff, clients or audience. Tense, nervous headache? Call Stagefright and let us worry about the entertaining so you can get on with joining in the fun. Nightclubs, family celebrations, annual festivities. Whatever, wherever. Professional entertainment is not as costly as you might think. So, call the professionals - call the army ... oops, er ... call Stagefright Entertainments. Saucy stories, risqué repartee, tittilating tales, adult-oriented mirthful magic, drunken jugglers and clowns plus all sorts of other stuff for you oldies. Stagefright Entertainments caters to the needs of the youthfully-challenged, providing over-sized fun for over-sized kids.